We didn't ever watch that much TV anyway, so I don't see canceling cable TV as much of a loss, but there is definitely a feeling of isolation without any TV access and if an emergency were to occur it would be nice to be able to tune in. 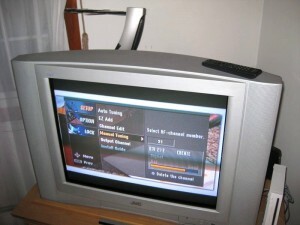 Well, TV is still being broadcast over the air though it recently went digital. 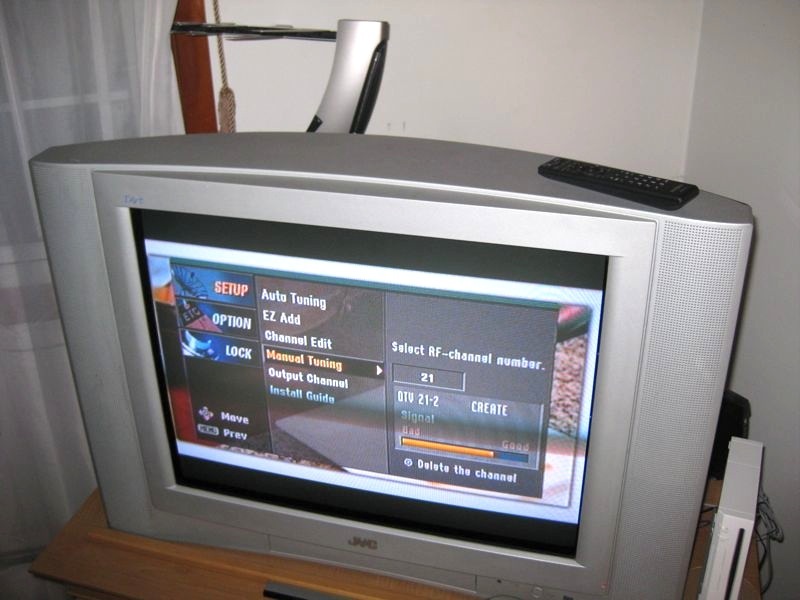 We applied for the DTV converter box at the time (anticipating this move) and I hauled it out to see what we could pull in. I only really wanted one particular channel - Channel 21 out of Garden City (about 25 miles away), PBS. Channel 21 in digital TV land is now three channels (21-1, 21-2, 21-3) and it would be really nice to watch the News Hour once in a while (and not having to stream it over the internet which you can do). It would be especially nice since we've actually pledged to the station over the years and now we can't receive it at all. I had taken down the old roof antenna years ago when we first had gotten Satellite (that was a great service, but trees grew up and I couldn't receive anything after a while), and frankly I didn't feel like clambering up on the roof and installing a new one. I'm also a bit nervous about lightning, perhaps because I've seen too many pictures of houses burned down for that very reason. Nothing for it but to scour the internets for some magic solution that would confound the laws of physics and grab in PBS. 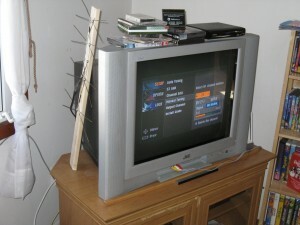 My first attempt was to build a small HDTV antenna based on instructions found in this video. I had all the parts I needed so I figured, why not? All the while I was putting the thing together I had this nagging feeling in the back of my mind that it was a big waste of time and I'd probably need a real aerial antenna to improve the signal, but I persevered. Finally, I was done and rushed to hook it up and check out what new crisp clean channels I could see. As I feared, the result wasn't that great. Of the two channels that did come in (in glorious HD), one was in Spanish. The other is a local channel which has pretty much garbage programming. I couldn't get enough signal on 21 to pull in any picture at all. I tried several positions and heights (only ground floor) with my DIY antenna and nothing improved it. My next test was to take apart the old aerial antenna (still stored in the basement) and using just the UHF portion, aim it directly at Garden City (thanks to the helpful mapping tool at antennaweb.org). This antenna is big, and certainly can't be left in the room like some of the small HDTV antennas being pimped at Best Buy could. I'd have to set it up outside or perhaps in the attic (just to get some height) to do a real test, but with just my initial placement I was able to get moving pictures on 21! They instantly froze and the signal dropped to "bad" and cycled up and down, but without any effort at all I was able to get a picture at least! The obvious answer is to run a cable up into the attic and point this sucker in the right direction and have another go. This will take some time (and cable) so I'll leave that for another day. UPDATE JAN 20, 2010 I was able to get fairly good signal with the aerial in the garage at a certain point, so I decided to put it up in the attic about two feet higher than that optimal position in the garage. After an hour of scrambling around up there, I gave up. For some reason that two foot made a big difference and I couldn't get any signal at all. 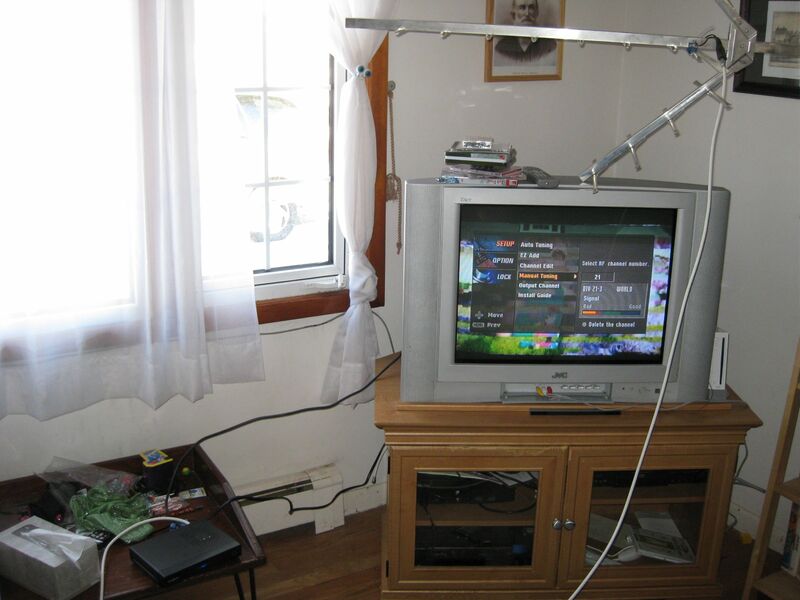 That's when I decided to take a gamble and buy a proper HD antenna. I did a bit of research on the subject and found quickly that there are now "smart antennas" which can self tune (electronically) but you need a DTV converter box which can use one. The smart antenna connector looks pretty much like an ethernet connector I've read. My DTV box isn't quite that advanced, so the best I could hope for was a UHF antenna with an in-line amplifier. 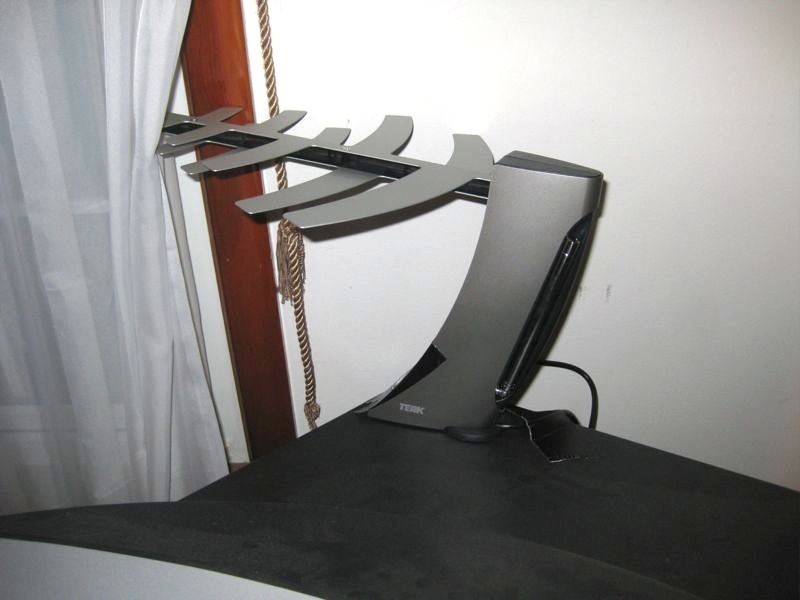 There are all sorts of these antennas, and hundreds of reviews of them. Since I had better luck with the aerial earlier, I looked for an antenna of the "periodic" (fishbone) type. I decided on the Terk HDTVa which I ordered from Amazon and received in just a couple days. 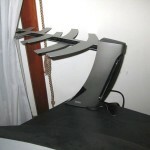 At $35 its one of the cheaper HDTV antennas, but if it could pull in three PBS channels I figured it would be worth it. It took a bit of fiddling to find just the right spot (at ground level on the back of the TV pointed out the window), but once oriented properly I was able to pull in all three Channel 21 stations. Best of all I didn't have to run a cable into the garage to do it. Some reviewers suggest that the amplifier didn't make any difference, but this wasn't my experience. Once the optimal position was found, I duct taped the antenna in place and monitored the signal with the amplifier on and off. In the best position I could pull in the stations without the amp, but with it on the signal improved about 17% (1/6 of the signal bar) which put the signal into the "good" range.